When did President Obama become such a lousy speech-maker? His remarks on Monday afternoon, aimed at calming the markets, were flat and uninspired — as they have consistently been throughout the debt ceiling crisis. “No matter what some agency may say,” he said, ”we’ve always been and always will be a triple-A country.” Is that really the best he could do? The markets, realizing he had little or nothing to offer, continued their swoon. What is particularly frustrating is that the president seems to have so little to say on the subject of job creation, which should be his most pressing concern. Actually, President Obama should have been concerned about job creation back in January of 2009. For some reason, this President had been pushing ahead with his own agenda, while oblivious to the concerns of America’s middle class. His focus on what eventually became an enfeebled healthcare bill caused him to ignore this country’s most serious problem: unemployment. Our economy is 70% consumer-driven. Because the twenty-five million Americans who lost their jobs since the inception of the financial crisis have remained unemployed — goods aren’t being sold. This hurts manufacturers, retailers and shipping companies. With twenty-five million Americans persistently unemployed, the tax base is diminished – meaning that there is less money available to pay down America’s debt. The people Barry Ritholtz calls the “deficit chicken hawks” (politicians who oppose any government spending programs which don’t benefit their own constituents) refuse to allow the federal government to get involved in short-term “job creation”. This “savings” depletes taxable revenue and increases government debt. President Obama — the master debater from Harvard – has refused to challenge the “deficit chicken hawks” to debate the need for any sort of short-term jobs program. In the late spring of 2009, Barack Obama had five economic policy principals: Tim Geithner, who thought Obama had done enough to boost demand and needed to turn to long-run deficit reduction; Ben Bernanke, who thought that the Fed had done enough to boost demand and that the administration needed to turn to deficit reduction; Peter Orszag, who thought the administration needed to turn to deficit reduction immediately and could also use that process to pass (small) further stimulus; Larry Summers, who thought that long-run deficit reduction could wait until the recovery was well-established and that the administration needed to push for more demand stimulus; and Christina Romer, who thought that long-run deficit reduction should wait until the recovery was well-established and that the administration needed to push for much more demand stimulus. Now Romer, Summers, and Orszag are gone. Their successors – Goolsbee, Sperling, and Lew – are extraordinary capable civil servants but are not nearly as loud policy voices and lack the substantive issue knowledge of their predecessors. The two who are left, Geithner and Bernanke, are the two who did not see the world as it was in mid-2009. And they do not seem to have recalibrated their beliefs about how the world works – they still think that they were right in mid-2009, or should have been right, or something. I fear that they still do not see the situation as it really is. And I do not see anyone in the American government serving as a counterbalance. President Obama has been oblivious to our nation’s true economic predicament since 2009. Even if there were any Hope that his attentiveness to this matter might Change – at this point, it’s probably too late. Now that President Obama has thrown Elizabeth Warren under the bus by nominating Richard Cordray to head the Consumer Financial Protection Bureau (CFPB), she is free to challenge Obama in the 2012 election. It’s not a very likely scenario, although it’s one I’d love to see: Warren as the populist, Independent candidate – challenging Obama, the Wall Street tool – who is already losing to a phantom, unspecified Republican. We argued yesterday that the Senate was not a good vehicle for advancing Elizabeth Warren’s aims of helping middle class families, since she would have no more, and arguably less power than she has now, and would be expected to defend Democrat/Obama policies, many of which are affirmatively destructive to middle class interests (just less so than what the Republicans would put in place). A poll conducted in late June by Scott Brown and the Republican National Committee raises an even more basic question: whether she even has a shot at winning. The poll shows a 25 point gap, which is a massive hurdle, and also indicates that Brown is seen by many voters as not being a Republican stalwart (as in he is perceived to vote for the state’s, not the party’s, interest). A 25 point gap is a near insurmountable hurdle and shows that Warren’s reputation does not carry as far as the Democratic party hackocracy would like her fans to believe. But there’s no reason not to get this pesky woman to take up what is likely to be a poisoned chalice. If she wins, she’s unlikely to get on any important committees, given the Democratic party pay to play system, and will be boxed in by the practical requirements of having to make nice to the party and support Obama positions a meaningful portion of the time. And if she runs and loses, it would be taken as proof that her middle class agenda really doesn’t resonate with voters, which will give the corporocrats free rein (if you can’t sell a liberal agenda in a borderline Communist state like Massachusetts, it won’t play in Peoria either). He’s about to lose his job. Blame as much of the problem on his predecessor as you like, the fact is Obama hasn’t come up with a solution. In fact, he’s made things worse by filling his top economic posts with banking-friendly interests, status-quo advisers and milquetoast regulators. And if there’s one reason Obama loses in 2012, it’ll be because he failed to surround himself with people willing to take drastic action to get the economy moving again. In effect, Obama’s team has rewarded the banking industry under the guise of “saving the economy” while abandoning citizens and consumers desperate for jobs, credit and spending power. 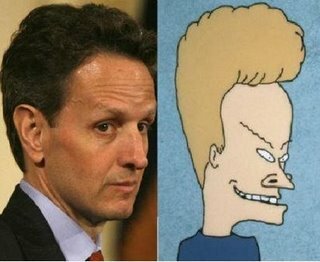 There was the New York Fed banker cozy with Wall Street: Timothy Geithner. There was the former Clinton administration official who was the architect of policies that led to the financial crisis: Larry Summers. There was a career bureaucrat named to lead the Securities and Exchange Commission: Mary Schapiro. To see just how unremarkable this group is, consider that the most progressive regulator in the Obama administration, Federal Deposit Insurance Corp. Chairman Sheila Bair, was a Republican appointed by Bush. The lack of action by Obama’s administration of mediocrities is the reason the recovery sputters. In essence, the turnaround depends too much on a private sector that, having escaped failure, is too content to sit out what’s supposed to be a recovery. What began as a two-step approach: 1) saving the banks, and then 2) saving homeowners, was cut short after the first step. Instead of extracting more lending commitments from the banks, forcing more haircuts on investors and more demands on business, Obama has let his team of mediocrities allow the debate to be turned on government. The government caused the financial crisis. The government ruined the housing market. It wasn’t true at the start, but it’s becoming true now. Despite his status as the incumbent and his $1 billion campaign war chest, President Obama could find himself voted out of office in 2012. When you consider the fact that the Republican Party candidates who are currently generating the most excitement are women (Bachmann and the undeclared Palin) just imagine how many voters might gravitate to a populist female candidate with substantially more brains than Obama. Many people are “disappointed” with Obama. But, while it is certainly true that Obama has broken many many promises, he projected his goals in his book The Audacity of Hope. In Audacity, he discussed how in 2002 he was going to give politics one more shot with a Senate campaign, and if that didn’t work, he was going into corporate law and getting wealthy like the rest of his peer group. He wrote about how passionate activists were too simple-minded, that the system basically worked, and that compromise was a virtue in and of itself in a world of uncertainty. His book was a book about a fundamentally conservative political creature obsessed with process, not someone grounded in the problems of ordinary people. He told us what his leadership style is, what his agenda was, and he’s executing it now. I expressed skepticism towards Obama from 2005, onward. Paul Krugman, Debra Cooper, and Tom Ferguson among others pegged Obama correctly from day one. Obama broadcast who he was, through his conservative policy focus (which is how Krugman pegged him), his bank backers (which is how Ferguson pegged him), his political support of Lieberman (which is how I pegged him), and his cavalier treatment of women’s issues (which is how Debra Cooper pegged him). He is doing so again, with his choice to effectively remove Elizabeth Warren from the administration. I just wish Elizabeth Warren would fight back and challenge Obama for The White House. If only . . .